My tiredness vanished. It’s possible that I began bouncing from foot to foot like a four year old. SNOW!!! I was born in the northeast. 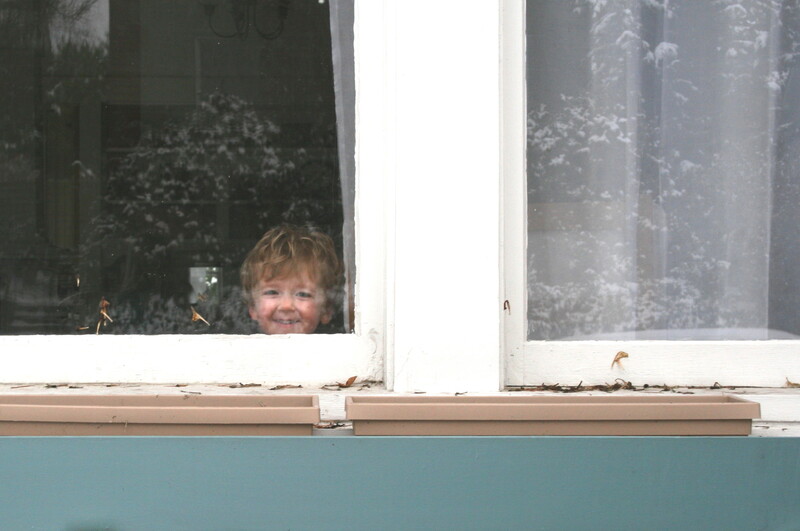 My first winter memories involve jumping off of a porch into snow that went up over my chin. 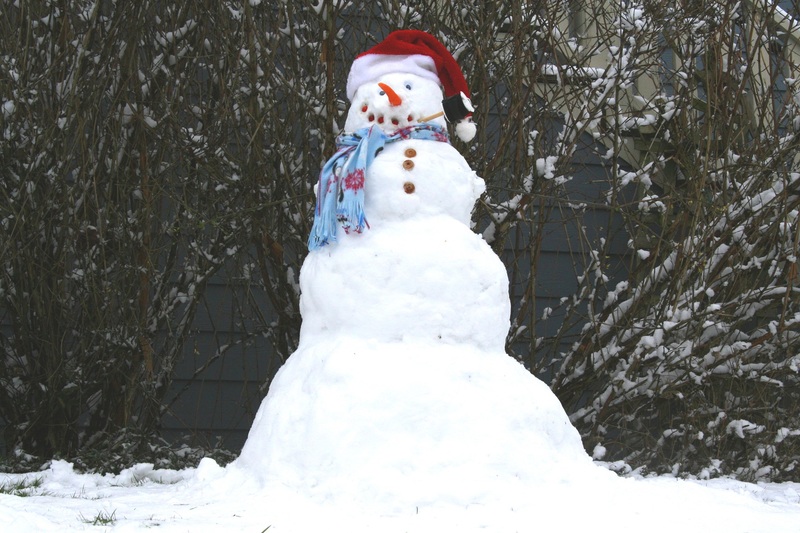 I wore a pink snowsuit so fluffy that I could barely bend my arms, but with my uncle’s help I still managed to build a snowman three times my size. This frozen christening began a fierce love of all things snow: snowmen, icicles, snow angels, snowballs, snow forts, and even the little ridges of snow that accumulated between my snow pants and my boots and fell out when I shed my frozen clothes in the front hall. I also took every sledding opportunity I could find, including one fateful day when my sister and I grabbed trashcan lids, opened the front door, lined ourselves up carefully on our second floor, and came thisclose to launching ourselves into epic staircase sledmania when our parents caught us. Then my family moved to Texas, where I spent ten winters staring sadly at all the yellow, dead grass. Sometimes ice glazed the whole city like a donut. But you can’t make a snowman from ice. If you throw it at people, it hurts and they get mad at you. 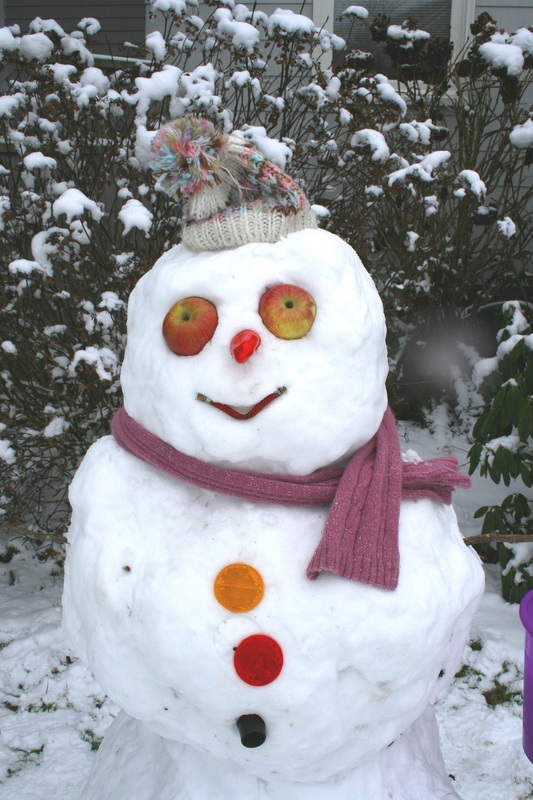 During those ten years I made exactly one snowman. It took all of the snow from my entire front yard, and it stood approximately eight inches tall. Texas taught me to celebrate every falling white flake. And although Seattle is nearly as far north as Maine, it only gets snow once in a blue moon. Worse, rain often erases the snow between one hour and the next. There have been many times when I’ve seen a thin coat of white outside, hurried to finish whatever I was doing, and looked up again to see nothing but naked wet pavement. Muttering in my head about responsible adults and reasonable sleep schedules, I lay in bed with my eyes wide open for what seemed like hours, trying to fall asleep so I could get up bright and early and go play in the snow. Now, I hate mornings. Sleeping in is my favorite thing about weekends, and even if I am awake, I often lounge around in bed, lazy, until at least ten. Sometimes noon. My husband usually makes it up long before I do. But not this morning. Adam cracked one eye open when I bounced up out of bed, laughed at me as I hopped around with one leg in my long underwear, and finally made his yawning way to his computer chair about the time I was trying to fit a second pair of fingerless gloves on over my normal flimsy ones. I asked him if he wanted to go. He kissed me on the nose and told me to have fun. I may be a little too big to fit on the lid of a trashcan these days, but over the next two hours I took hundreds of pictures. Pictures of dogs playing in the snow. Pictures of kids playing in the snow. Pictures of kids and dogs running through the snow dodging snowballs. 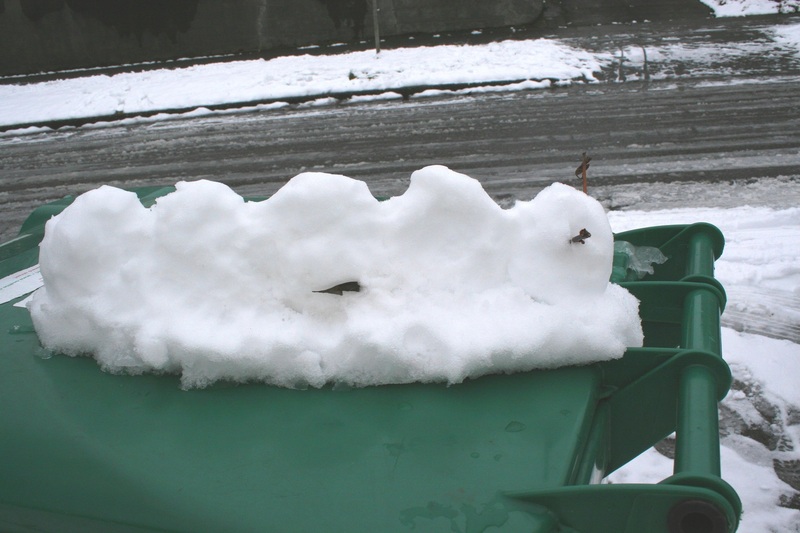 Pictures of snowmen, snowwomen, snowchildren, and even one snowcaterpillar on a recycling bin. And a picture of a friend I made. I happened to glance up and see him staring out the window like he just couldn’t believe his luck, his face scrunched up into the happiest, crinkliest-eyed smile I’ve ever seen. I waved at him and he stood up to wave back, his whole body shaking like a puppy wagging its tail. Then he sunk back down to the window sill, still grinning out at me and the wonderland outside of his window. Both of us knew the same secret: the morning had given us a beautiful, amazing surprise, and at that moment, nothing else mattered. Happy snow day, little buddy. Tom was sooo excited at our first real snow in New Mexico. Not so much when it went on for days! I’m still the same way even though I know it means shoveling walkways and using more propane. 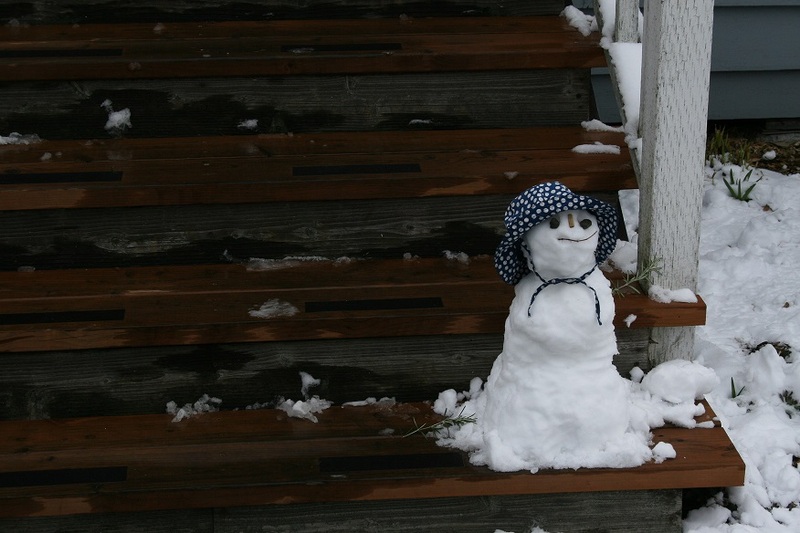 One thing that is nice about snow in Seattle is that it all tends to melt in the rain – no shovels required.